One of the funniest sections of the movie The War on Kids for me is when a chorus of children try to identify photos by noting which is a school or a prison; the humor occurs because it is so hard to tell the difference. 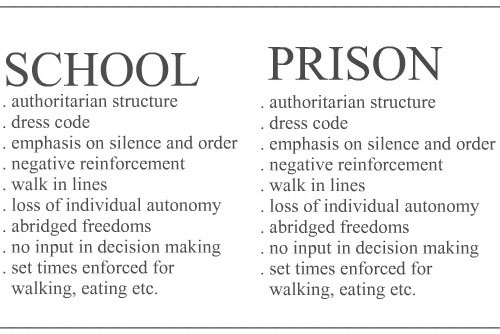 The movie then sadly shows, in a variety of ways, how much like prison modern schooling has become. The saddest thing, to me, is that most viewers support this vision of education, feeling that school should be prison-like (though a humane, soft prison) because children can’t be trusted to learn anything worthwhile unless forced to do so. As a result, the word education has been misconstrued to mean something done to us rather than something we do for ourselves with help from others, and school, which was a leisurely activity for ancient Greek aristocrats, has been turned into a form of jail for most children. The original meaning of the word education is something every person and animal does: nurture and rear children. The Oxford English Dictionary notes the Latin word educare is the root of the word educate, and defines it this way: “To bring up (young persons) from childhood so as to form (their) habits, manners, intellectual and physical abilities.” This is not the same meaning as the often used and substituted word educere—to lead forth—that is related to our modern word, educe, and is typically used by schools to justify their compulsory and authoritarian methods. By confusing the origins of the word educators give themselves license to lead, or draw forth, whatever they feel they need to put in or pull out from a student. This is totally different from the suckling, nurturing educational relationship of the original word. Is it no wonder then that today our politicians talk about educating the public about their positions, meaning to convince the public to support them? Dictators in various regimes use educational techniques like compulsory attendance and rote, or entire facilities, such as the Vietnamese re-education camps, to make the public believe or see reality as the government or other institution wishes them to. The ironic use of the word education hit a new height for me as I read about the problems associated with the Community Education Centers, a for-profit company that operates halfway houses for prison systems in different states. By taking a word like education and continually using it to refer primarily to obedience to authority we lose sight of its original meaning—growth through nurturing from concerned adults—and replace it with compliance to a mandatory process that has very little to do with nurturing natural growth and everything to do with managing the contents of another person’s brain. Columnist James Altucher wrote a column about unschooling recently and he compared schools to prisons. Here is his list of similarities, FYI.